We have received a response through a Facebook message from Councilman Jason Walker of Duvall, Washington regarding our campaign. We asked them to take action over the dog meat trade in Jangheung, South Korea. 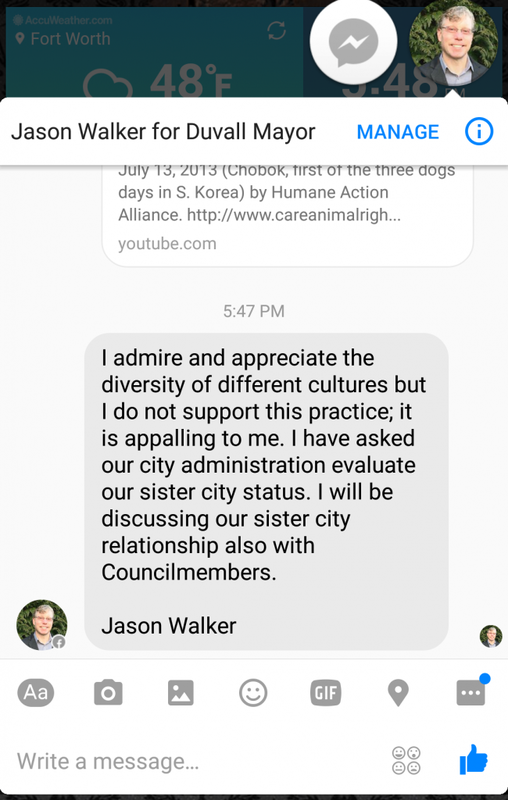 We are grateful to Councilman Walker for responding to our concern so quickly, and expressing his condemnation of the dog meat cruelty in Korea. He informed us that he has already asked their administration to evaluate Sister City status and also promised us that he will discuss this issue with his fellow council members. We hope that the Duvall City leadership will decide to use their position to speak out against the horrible cruelty, and urge Jangheung County to enforce the law to close down the illegal dog meat industry. Please send an email thanking Councilman Walker for responding to our concern and for his support of our campaign. You can use our suggested message below or your own words. I would like to thank you for responding to our concerns raised via the recent petition on Change.org about the mistreatment, torture and consumption of companion animals in Duvall’s Friendship City Jangheung. And thank you for asking your city administration to evaluate your Sister/Friendship City status and for your plan to discuss your Sister/Friendship City relationship with Council members. Both domestic and international pressure on this issue is required if we are going to incite some real change in South Korea. So we hope that the leadership of City of Duvall will be able to add your voice and help bring an end to the horrific and illegal practice of the dog meat trade for good. Dear Mr. Councilman Walker, Thank you from the bottom of my heart for your stance against the horrific dog and cat eating industry. The more influential men like yourself who have the courage and humanity to speak out, the nearer we we will be to committing this atrocity to history and moving forward to a better world. Thank you. I sent EMail, thank you from the heart! Dear Councilman Walker, Words can not express how appreciative those of us who have dedicated ourselves to eliminating this atrocity, this abomination to persons such as yourself who speak out. This is our mission and may God bless you for helping us but mostly the dogs. Thank you for standing with us who find this practice cruel and disgusting. I appreciate you! Thank you Sir for demonstrating compassion and empathy for the poor crearures subject to such barbarity. Thank you so very much for your strong advocacy for the worst treated animals worldwide. China treats does not DESERVE to host the Olympics! Until it has learnt. That dogs & cats are not food. In fact all of the innocent animals are given compassion and shown respect! The previous message I have posted should read: All dogs & cats. Are not food! In fact! All the innocent animals who are cruelly tortured. Should be shown compassion and respect with love and care. Before an event like the Olympics is set in place. that dogs & cats are not food! innocent animals and had such, should be shown compassion a lot of respect. .its beyond any horror film u could imagine. Thank you so much for having a heart and compassion for the innocent animals of this horrible trade. Please keep condemning this barbaric practice. Thank you for Caring Mr Walker. Man’s best friend should not be subjected to Korea’s cruel and horiffic barbarism. Please help end this sick practice once and for all. This is not simply eating meat for food. It is torture. Cruelty like no other, resulting in slow painful deaths that are senseless and brutal.